These keto pancakes are airy and fluffy. 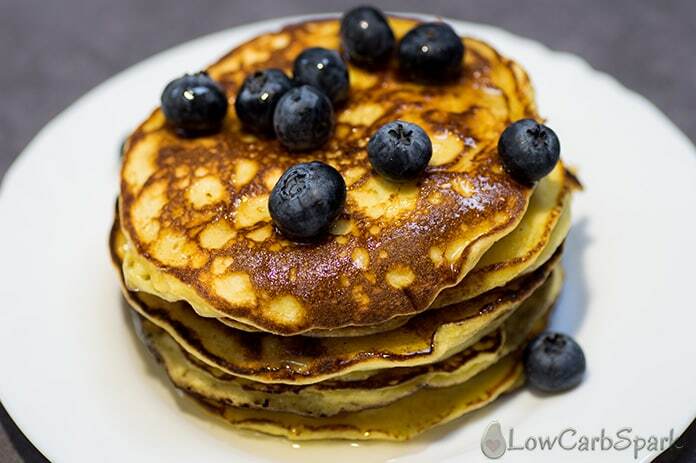 Enjoy low carb pancakes without sugar and starch. 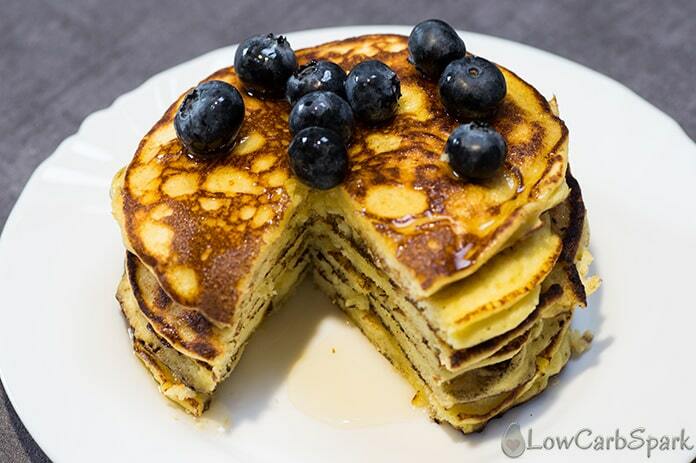 A serving of these delicious coconut flour pancakes has only 6g net carbs. Serve them topped with butter and sugar-free syrup. Try this recipe because it’s excellent if you are looking for a low carb version. Keto pancakes are my go-to dessert (or breakfast) when I want to indulge in something sweet, flavourful and effortless to make. It only takes 5 minutes to prepare the pancake batter and 10-15 minutes to cook them. Everybody all over the world loves pancakes. A pat of butter slowly melting on a stack of pancakes with some sweet (maple) syrup. This sounds like a childhood lazy Sunday morning when the smell of fresh and buttery pancakes was the wake-up alarm. Oh, the great memories? When I am craving a chocolate rich cake, I make my Super Easy Keto Chocolate Brownie Mug Cake. That’s another ridiculously easy and tasty keto dessert I love love love to make. This recipe yields 6 decent sized pancakes. A serving of 3 pancakes has 6g NET carbs. 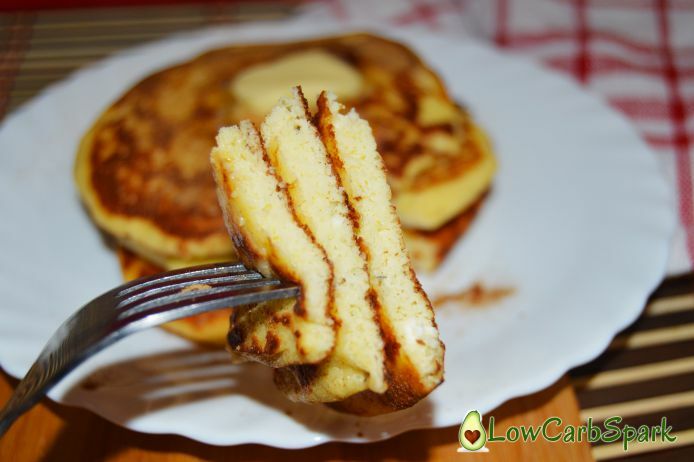 Another great thing is that these keto pancakes aren’t made with almond flour, so this recipe can be savoured even by those of you with an allergy to almonds. 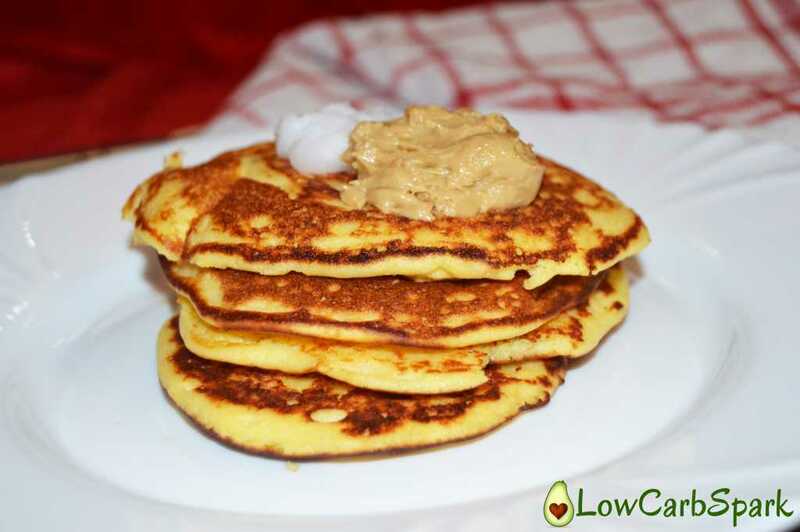 I love to serve the pancakes with 1 tbsp of coconut oil and some sugar-free peanut butter. To keep this fantastic recipe low carb and keto friendly, I used coconut flour. You will need a small quantity since it has the property to absorb well a lot of liquid. Using coconut flour will yield pancakes that are very low in carbs, but also pretty low in calories compared with the almond flour pancakes. I usually love to make single serving recipes, and this one yields 3 decent sized pancakes that you can enjoy freely. If you need to make more servings, you can simply double or triple the recipe, the result will still be amazing. A perfect keto pancakes recipe that will make you forget about the old style high in carbs pancakes. I used cream cheese, but you can also use mascarpone cheese for a rich and dense taste. If you are looking for a paleo version you can use coconut cream, coconut milk and coconut oil to replace the dairy products. 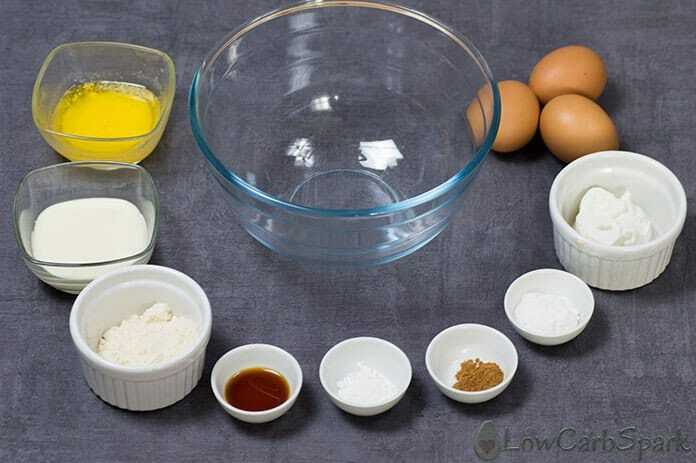 What’s also impressive how fast you can mix all the ingredients for the low carb pancakes to make the perfect batter. After you gather all you need it’s a matter of minutes. After whisking all the ingredients, proceed as usual and heat up a pan and melt a pat of butter. Spread the mixture into 3-inch circles and flip when bubbles start to form on top. Let them cook for another 2 minutes, and you are ready to enjoy the incredible keto pancakes. To substitute 1/4 cup coconut flour, you will 1 cup almond flour. You should probably reduce the liquids too since the almond flour is not as absorbent as coconut flour. Just play with the ingredients until you get a thick pancake-like consistency. Lately, I have been using a homemade keto sugar-free syrup that is absolutely delicious, easy to make and almost zero carb. I know that on the market you can find lots of sugar-free syrups and some of them are actually really tasty. You can definitely go for it, but here’s an easy and quick recipe for my favorite keto pancake syrup. Melt the coconut oil and the butter. Add the sweetener, maple extract, and mix. Pour over the hot pancakes and enjoy. 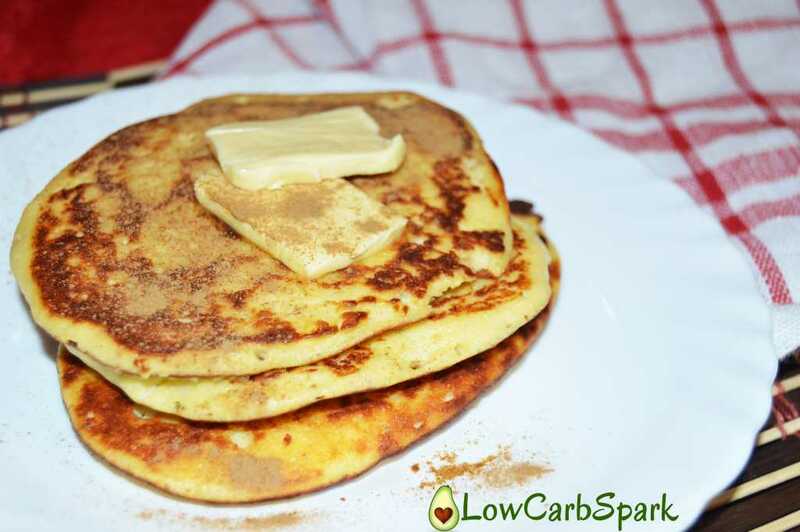 Make the keto pancakes, and you will end up eating a lightly vanilla scented dessert with a subtle sweet cinnamon flavor (which you can omit). Thanks for sharing this recipe, can you please clarify…2 pancakes is 4g NET carbs but what are the 22g is that the total carbs? This recipe is so good! I've made them twice now and they've been amazing both times! That's awesome. I am glad you liked our keto pancake recipe! You don't need to use salt in this recipe. My bad! What other sweetener can we use? You can use any keto approved sweetener like: Monk fruit powder, Stevia, Xylitol, Erythritol. Can you substitute the coconut flour for moms flour? Googled the mom's flours and the ingredients are: White Rice Flour, Potato Starch, Tapioca Flour, Xanthan Gum.These flours are not keto friendly at all. Almond flour instead of coconut flour? I want these right now & only have almond flour? You will need to use about 1 cup almond flour instead of the coconut flour. I loved the recipe, I changed the sweetener to Splenda brown sugar blend and I also made waffles. I used whipped cream for my topping,perfect ! Thank you, Debbie! That’s fantastic! That's amazing. I am really happy you liked the pancakes! Have a great week! Maybe the batter was too watery. I've never had this problem before with the pancakes. Mine did the same on a cast iron. 1/4 cup coconut flour may have to use a little more next time. No Stevia used, nor any sugar sub and tasted delicious without. Mine were also very thiN and took a reallY long time to set up so they were firm enough to flip. First time i amde them so will def use more coconut flour next time. But they do taste very good! If the batter is too thin, add more coconut flour. The eggs may have a different size. 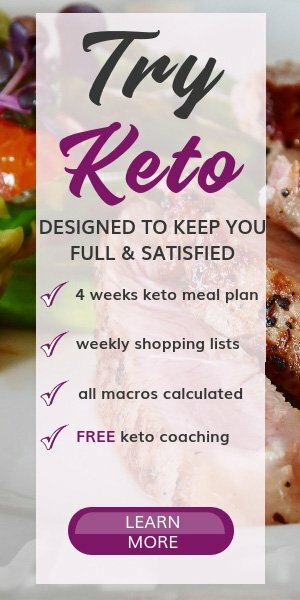 What is the nutritional values of the keto syrup? The one I use has 1 net carbs for 2 tablespoons. These are so good! I've really missed pancakes and now I can have them. Just as good as the ones made with wheat flour. Thank you! Absolutely fabulous! I've tried SO many recipes that all turned out like crepes….these were amazing! That sounds awesome. I am really glad you liked the recipe! 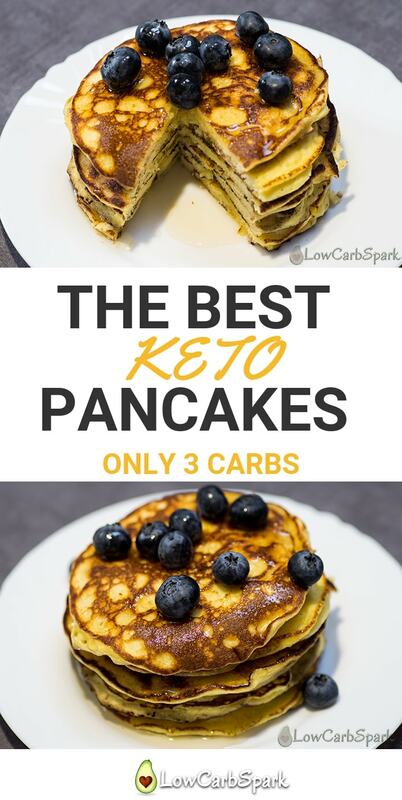 I’ve done many recipe testing to find the ideal keto friendly pancakes and these are the best! No need to search anymore! Yum! You made my day better. Thank you for the kind comment, and I am happy you liked my keto pancake recipe. Trying to make these and the mixture is super thick. I’ve added extra heavy cream (a splash) and almost half a cup of water. I’m not sure they’ll be any good but I’m definitely hoping! It really depends on the coconut flour brands. Some absorb more liquid than the others. In the end with the right adjustments made, the keto pancakes still taste great. I didnt have any cream cheese so I drained some sour cream and added a little more baking powder and a little more coconut flour. My non keto son even loved it with 1/4/cup heated berries mashed with butter. Made the breakfast muffins last night. He loved those too. Ps….. I loved them better! I am so happy you liked the pancakes and breakfast muffins. What a great idea to heat berries and butter for the topping. Thank you so much for sharing. Can't wait to make them! Can you freeze them? I would like to make a whole batch and freeze. I have never tried freezing the pancakes. I like the keto pancakes fresh and hot. They are super easy to make, and it takes like 5 minutes to whip everything up and cook. If you try them, let me know how they turned out! We freeze ours and they are perfect. We reheat for 1 min -1min 30 seconds and they are hot just like the day you made them! Wonderful addition to our keto! Your coconut flour is probably more absorbent than others. Add a little bit more liquid than the recipes requires. Also, try not to over bake them. Hope it helps! Omg! Seriously so good! I’m not a pancake fan mainly because of how I feel after I eat them….bloated and gross. I dont recommend making these when you are home alone, you may just eat them all! Don’t ask me how I know this. I also added some cooked bacon bits to the batter and topped them with sugar free syrup and whipped cream. Love! Just check the fiber content and subtract it from the total carbs. Sounds great, Cass! I am very happy you all loved the keto pancakes. casseroles, I haven't ventured into breads. I decides to try your recipt. It look simple and photos, the outcome looks delicious Don't really want to take the time to take photos. Do I'll give you a description of my experience. PS They don't look horrible. The batter was unusually thick. I managed to cook 2 pancakes and they, of course, had to be spooned onto the hot surface. I tasted them. They fell apart and were super grainy. Now maybe this is normal, but mine sure didn't look like yours. I have eaten some and the keto "fullnes"s factor is there. The taste is tolerable, but will be throwing out my expensive batter. Would love to hear where I went so desperately wrong. And will possibly try again. Thanks for listening. Any help would be appreciated. Hello Glenda! The coconut flour you used probably absorbed more liquid. Just add more water or almond milk until you get a pancake consistency. I should probably make a video showing exactly how to make them. How many pancakes do these yield with the coconut flour. Hey there. This recipe yields 6 coconut flour pancakes, perfect for 2 servings. If you want to make a bigger batch, you can double or triple the ingredients. I see in the article this recipe yields 6 decent sized pancakes and a serving is 3. In your comment answering a question you say this recipe yields 3 Pancakes. Also in the nutrition facts it says servings 3. So if you could clarify? I’m just trying to enter in the proper nutrition facts to my app. Hello Aly. You are right. The recipe makes 2 servings of 3 pancakes. The serving size is 3 pancakes or half of the number of pancakes you make. Hope this helps. 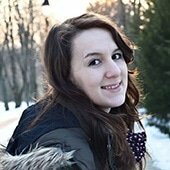 Thank you for being here, Amberlee! These pancakes are delicious! I've tried other keto pancake recipes and they don't compare to this one. I've made this recipe several times and wouldn't change a thing! Could I make this recipe without the sour cream or hwc? I have been craving panckaes and I really want to make the coconut flour pancakes in the morning but I do not have sour cream or hwc? I need to go shopping but for now I sit ok if I omit them or is there another substitute I could use? Thanks in advance. You can substitute the heavy whipping cream with cream cheese to get that delicious creamy texture. Didn’t have heavy whipping cream so I tried 1/2 and 1/2. Also subbed in almond extract and hoped they would set up okay. They were absolutely amazing…so amazing that this is the first time in 53 years that I have reviewed someone’s recipe. Thank you for sharing and for saving me from another morning of scrambled eggs! Wow, thank you so much, Susan. I am happy you liked the keto pancakes. I am sending you good thoughts. These were delicious! I mixed everything up in a small blender (think Nutrabullet) and everything fit. Added a bit of flavored stevia liquid drops, and a dash more cinnamon! Mmm! I did not have the 3” rings, but this recipe produced 4 large pancakes (6” diameter) that still rose nicely – better than many cream cheese pancake recipes I have tried! Not sure if it was due to the baking powder or coconut flour? Any who, I will definitely purchase the rings because I can then use them for eggs! 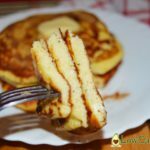 Definitely try this if you’re low carb/Keto and are longing for pancakes!! Better than Flour Pancakes! Was craving something cake or bread-like, my one weakness, and what I miss most on keto diet, but I'm down 30lbs, so I'm sticking to it. Used exact ingredients, but I separated the eggs and whipped the whites to fluffy clouds with 2 tsp of the monk/ erythritol. Mixed the rest of the ingredients, then folded in the whites for perfect batter. It made about 10 pancakes, SO GOOD. Tasted like madeleines cookies. They Do freeze well! Stored about 6 of them in freezer, Pulled 2 every morning before work, throw in the toaster oven 5 minutes. All that buttery goodness made them so soft again when warm. I could even say they were better the next day. I spread almond butter instead of syrup, pancakes were sweet enough. Making new batch today. Hey there! Thank you for the kind comment. I am super happy you liked the recipe!! Your advice regarding freezing the keto pancakes may be very helpful to others!!! Tasted wonderful !! Would use one less egg because it had a little bit too much of an eggy flavor for me . Super awesome keto pancakes! No strong eggy taste and not heavy at all!!! The cinnamon and overall texture is more like French toast in my opinion but still fluffy like a pancake. The few batches we’ve made have turned out a bit darker than the picture but did not have a burnt taste at all. This recipe is a win!! Can you make the pancake mix ahead of time and refrigerate it? I just made these pancakes. I found that they were very thick so I added a little more heavy cream. I found them grainy and they fell apart easily. They were hard to flip and ended up a mess in the pan. They tasted good and my husband ate them. He said he would eat them again. So I’ll try them again next weekend. Maybe I’ll try a difference brand of coconut flour. I have tried several keto pancake recipes, and this was the best one by a long shot! It will replace all the other recipes I’ve tried. What type of Swerve did you use? Confectioners or granular? In this keto pancakes recipe, I used granular sweetener. Great recipe! Thank you for sharing! I found this on Pinterest. I really love the texture of these pancakes. I added ginger and nutmeg for a bit of festive flavor. Like you said, great with a pat of butter melting over the top!!!!! Thank you, Natasha! I am really happy you liked the recipe. Adding those spices is a great idea. I Don’t have heavy whipping cream, can I use coconut or almond milk? Yes, you can use one of those milk instead. Not bad! I doubled the recipe and it seemed a little thick so i just added water. It will DEFINITELY curb your craving for pancakes. I added Maple extract to the batter and served it with melted coconut oil and butter and berries. sooo good. Oh and coconut cream sweetened with stevia. It was very satisfying. Tasted like french toast to me. Thank you! Caps key Stuck. Sorry. Sound incredible, Anne. I’m extremely happy you enjoyed my recipe! Made these for the first time today they were close to the real thing! Thinking I might try to make a coffee cake out of this recipe. Do you think that would work? You should probably double or triple the recipe. So these are really really good !!! Oh and I didn’t use any sweetener and they were still good. Topped with blueberries and tiny tiny bit of maple syrup. So good for Pancake Day ! Have made these several times and my whole family loves them, even the dogs, my moms 15 year old Shi Tzu can’t wait when she smells them, absolutely will not eat any other pancakes! Lol thank you for the recipe. i am mixed up on the servings and how many carbs and sugar per pancake. i have not made these yet but plan on doing it tomorrow. thank you also for the syrup recipe. I made these this morning they were easy and tasty, thank you! Hi on the whipping cream..is that the one that is liquidy or the one thats fluffy? I m sorry im new to this stuff so I just want clarification..:)..
Hi there! You’ll need to use the heavy whipping cream that’s liquid and has no sugar added. Hope it helps! Keep up the good work! Well, thank you! I love coconut flour pancakes better than then almond flour ones, but I’m still on the quest of finding a recipe worth sharing on the blog. Keep up the good work! Just tried your pancake recipe and they were awesome. It’s the first time i’ve tried any pancake recipe and glad I chose this one. Thanks for sharing it. I made these with almond flour , 1 cup EXCELLENT !